Welcome to the end of week seven, ANU! As confirmed by demographic data, this week auspiciously represents the time when the most students stop coming to lectures and never come back. If you’ve been avoiding eye contact with your professors and staying away from campus, here’s what you might have missed. The Research School of Social Sciences will be brought together under one roof in a six story complex. 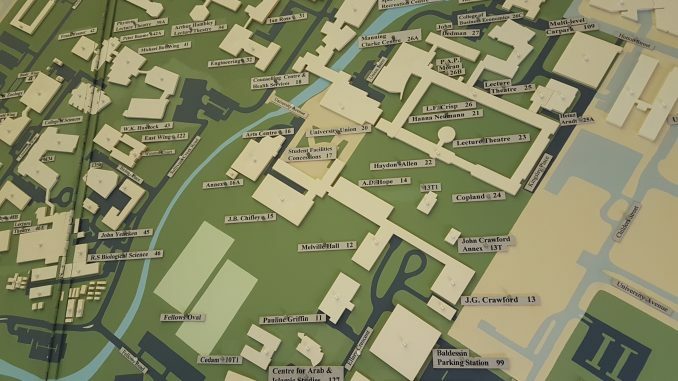 The building will be due for completion at the end of 2019, and encompass the ten locations for the school that are currently sprawled across campus. It will sit on the current site of the Pauline Griffin Building. This development is responsible for the blocking of pedestrian access between Melville Hall and Pauline Griffin. The ANU contender for the World Solar Car Challenge was this week unveiled, after more than two years planning and building. The MTAA Super Charge and the team of 30 students involved in the process will be competing against some of the world’s largest car companies and will race between Darwin and Adelaide. Lecturer Dr Michael Zekulin, initially planning to come to the ANU to teach Counter- Terrorism course POLS 3036, was denied entry due to recently tightened visa regulations. The ironic incident left the course without a permanent lecturer until week 4 of the semester. Read Observer’s coverage here. The ANU Queer* department celebrated Pride week with the theme of ‘Strength in Diversity.’ The colourful celebrations were hosted in conjunction with ANUSA and provided a range of activities for Queer* members and allies, including trivia, Queer* ball and a keynote address from Chief Minister Andrew Barr. The BKSS held a an evacuation drill on Wednesday, leading to a choke point at the Melville Hall entrance, where people were trying to get in while others were still evacuating. The SRC voted in favour of creating a committee to award honoraria (payment to student volunteers), after clashes between the executive and the SRC over the issue. Read more about it here. The SRC also voted to support the excusal of students from assessments and exams if they fall on religious holidays, in order to create parity with the public holidays afford to Western Christian celebrations. In news abroad, University of Western Australia voted to remain affiliated with the NUS in their referendum, with over 2,000 votes in favour of the move.